You can play the classic game of Tic-Tac-Toe or 2 other kids games. One from China and the other from Korea. Both games are easy to learn and fun to play with young children. 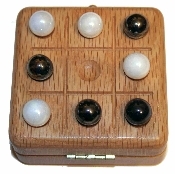 When you are finished playing, store the marbles inside the game and latched the game shut. Comes with 10 marbles and instructions.